Unsurprisingly, Skyrim: Special Edition quickly became one of the most popular games on Steam over the weekend. And given that she had already established herself as a channel for older gamers and Skyrim fans, it made sense that Shirley Curry, aka Grandma Shirley, would return to Skyrim. Her 300th video highlights just how prolific the 80-year-old gamer has been when it comes to updating her YouTube channel. Her first Skyrim Let’s Play was uploaded on September 18, and since then she’s received a Silver Play button from YouTube — a button given out to channels with more than 100,000 subscribers. The Virginia-based grandmother, who refers to listeners in her videos as “grandkids”, has started a new series for Skyrim Special Edition (above). 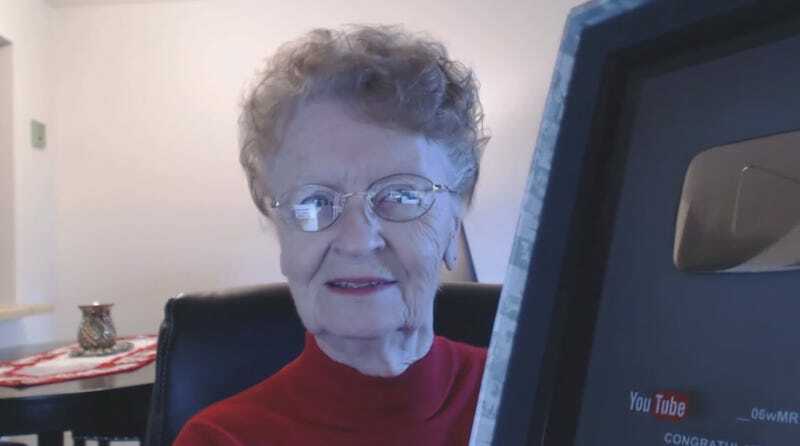 Her videos already gained a following for their calming, almost meditative quality, so considering how popular Bob Ross has become in the past year it wouldn’t be surprising to see Grandma Shirley (or as I like to call her, Granny Skyrim) catch a second wave of new fans. More importantly, it’s just great to see someone at the age of 80 just enjoying and exploring Skyrim with as much thrill and wonder as ... well, anyone else. Sometimes I wonder whether I’ll still enjoy games when I’m 60 or 70 (if I’m fortunate enough to live that long) the way I do now. Grandma Shirley says I probably will. And that’s a nice thought for a Monday.